The link for the Genealogy Standards is here: https://www.amazon.com/Genealogy-Fiftieth-Anniversary-Certification-Genealogists/dp/1630260185. The PDF of the proposed standards is here: https://bcgcertification.org/DNA/Proposed_Standards.pdf. The link for the survey is here: https://goo.gl/forms/57ahXLqkAYOBWDop2. The Trustees of the Board for Certification of Genealogists (BCG) met in Grand Rapids, Michigan on 2 May 2018. 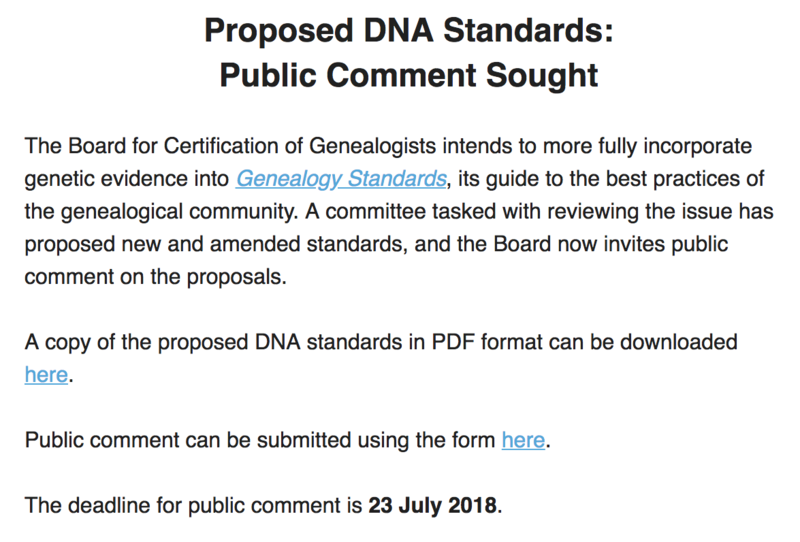 The trustees…debated a proposal to update genealogy standards to incorporate standards related to genetic genealogy. As a result of this discussion BCG intends to move forward with the integration of genetic genealogy into Genealogy Standards. The board directed that the committee’s proposal be published for public comment. The proposed standards can be viewed at https://bcgcertification.org/DNA/Proposed_Standards.pdf. The public comment period ends on 23 July 2018. Fill out the survey at this link (https://goo.gl/forms/57ahXLqkAYOBWDop2) by 23 July 2018. Due to the expected volume of comments, we will not be able to acknowledge or respond to individual comments. ... Click to read more!